Igor loves his family very much, and never spent a night away from them since becoming a member. So when they left their home in Norway to go on vacation in Thailand, dad turned his kennel into a replica of their living room so Igor would be happy. The family should have been looking forward to spending their Easter vacation on sunny beaches across the world, but instead they worried about their beloved English bulldog. They didn’t want to leave him home alone with a sitter to periodically check on him, and wanted him to be in a place where he’d be safe and not alone. But a boarding facility isn’t the most inviting living accommodation. Enclosed in a cage with a cold, concrete floor, surrounded by anxious, barking dogs – who could feel welcomed? But Igor was in for a pleasant surprise. 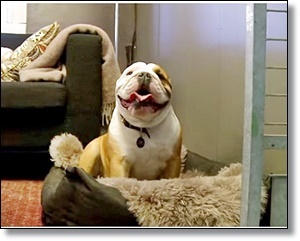 His dad didn’t want him to be confused and uncomfortable in a scary new place on his own, so he got permission from Labben Kennel to transform Igor’s personal kennel into a facsimile of the Halvorsens’ living room! The walls and floor were made to look the same as the ones at home, and dad brought their furniture to be set up before Igor arrived. When departure day came, Igor whined as he was loaded into the vehicle. But he and the rest of the family were in for a treat – the kennel looked just like home. When the humans left, Igor couldn’t even be bothered to care.